The Lake George Winter Carnival… Every weekend in February! The 1st Annual Lake George Winter Carnival was held in the winter of 1961. Now, over a half-century later, this celebration of all the great Adirondack wintertime outdoor activities continues with 4 activity-packed weekends during the month of February. 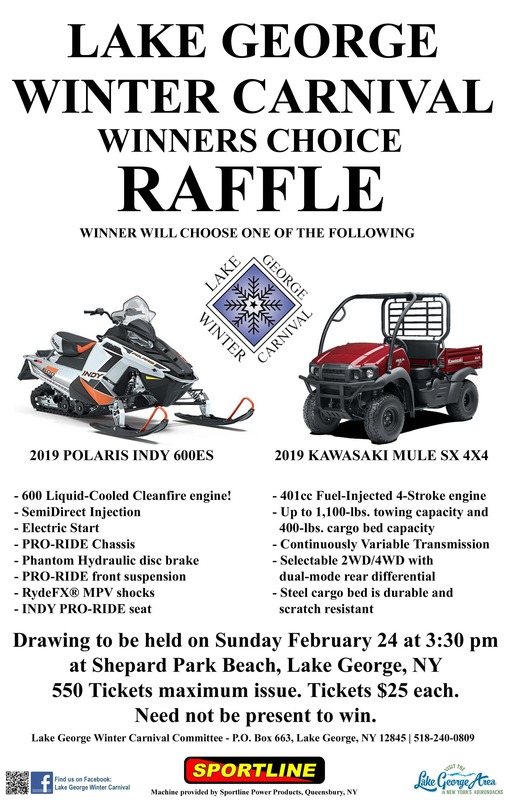 **2019 LGWC Winner’s Choice Drawing Sunday February 24, 2019 @ 3:30pm!! Make sure to get your tickets!!! Visit our Souvenir tent in Shepard Park!! Below you will find this years 2019 Winners of events below! Although there are only 1st, 2nd and 3rd places, The LGWC would like to acknowledge that just because a participant/establishment did not place, they are still considered winners! Honorable Mention: LG Barber Shop! Did you know that the LGWC is a ALL VOLUNTEER committee?? The LGWC is entering into 58th year for 2019 season and is always looking for great people of any age to volunteer in many areas such as children’s activities, cook offs, games, golf, security, outhouse races, etc. We would love to have anyone who is interested in meeting new people and have fun, helping a great activity join our great group! Don’t forget to check our Facebook page (Lake George Winter Carnival) for the most up to date information throughout the Carnival, Due to mother nature, there may be times that the Lake George Winter Carnival events may change– Any updates and/or cancellations will be posted as they may arise.